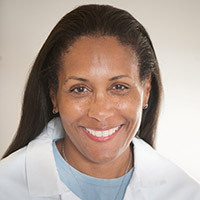 Dr. Karol Watson is an attending cardiologist and a Professor of Medicine/Cardiology at the David Geffen School of Medicine at UCLA. She is Director of the UCLA Women’s Cardiovascular Health Center, the UCLA-Barbra Streisand Women’s Heart Health Program, Co-Director of the UCLA Program in Preventive Cardiology, and Director of the UCLA Fellowship Program in Cardiovascular Diseases. Dr. Watson is a principal investigator for several large National Institutes of Health research studies including the Diabetes Prevention Program Outcomes Study and the Multi-ethnic Study of Atherosclerosis. She is a Fellow of the American College of Cardiology and a member of the American Heart Association. She is also a Board member of the American Heart Association, Western States Affiliate, and Chairperson of the Scientific Advisory Board for Womenheart, the largest national organization for women survivors of heart disease.